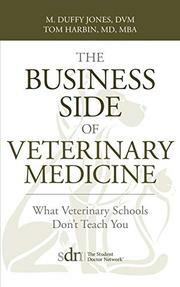 A debut guide seeks to flesh out the often lacking business education of veterinary school graduates. Jones and Harbin open their thought-provoking work by cycling through some common comments made by recent graduates of medical or veterinary schools like “I didn’t study medicine so I could obsess about business,” and “I just want to take care of animals; I’ll let somebody else handle the money.” And in response to such assertions, the authors ask a crucially simple question: “Where did these doctors get the idea that they would be exempt from the forces that rule everyone else’s lives?” Jones and Harbin are quick to dispel this notion, acquainting such recent graduates with the whole world of business-related items they’ll need to know about in order to make any actual use of the degrees they worked so hard to acquire. These matters include attracting patients, coping with veterinary referrals, conducting business correspondence, managing staff, investing in a retirement plan, and—for those who choose to go this route—negotiating the often Byzantine world of large corporate caregiving organizations. The authors point out that most medical and veterinary schools offer their students little or no practical preparation along these lines, and their book is intended as a one-source corrective to that oversight. Here readers will learn the intricacies of contract negotiations, operations management, personal and corporate finance, and the best (and worst) techniques for building a practice. Elsewhere the advice gets more specific to the veterinary world, with Jones and Harbin describing the various types of pet owners, for instance, and the different diplomatic approaches necessary for dealing with them. Many of this manual’s readers will find themselves in some kind of managerial position whether they plan for it or not, and on this subject the authors are at their strongest, dispensing some simple wisdom about how to get people to do what you want. Novice veterinarians should find the volume invaluable, but medical and business school graduates will likely discover a variety of worthy tips in these pages as well. A succinct and approachable handbook for all the stuff that comes after the veterinary degree.